The Raphael room was also a highlight, with the "Portrait of Pope Leo X" and how he was able to blend colors to create 3 shades of red to highlight fabrics and how this piece highlights his skill. We saw painting after painting and statue after statue - almost like artwork overload! It is hard to take it all in when you leave one of the most widely known pieces of art; only to turn the corner and see another one or two in the next room! Astounding and once in a lifetime! 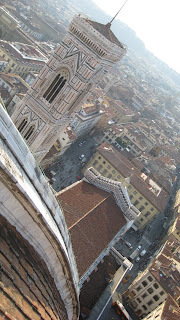 We then had more free time and some returned to the Duomo to climb to the top of the dome and see some spectacular views of the city. It was less of a climb than it was for the group in Rome who climbed to the top of St. Peter's but it was still pretty high! Tomorrow we are off to Venice (wake up call at 5:45 and leave the hotel at 6:45AM) but it is sure to be great! Everyone here says hello to family and friends!